News, opinions, stories and general tid bits about the Chemical sciences. If you’ve been paying attention to the world of chemistry, physics or materials science in the past couple of decades or so, you’ll know that carbon nanomaterials have been really hitting the headlines. Graphene, fullerenes, nanotubes and nanofibres have been advertised as possible new materials for a variety of applications, and research groups have sprouted up around the globe to investigate these. Now, Professor Stuart Licht of Washington University has found a way to produce such materials by capturing and transforming the CO2 found in the air around us. 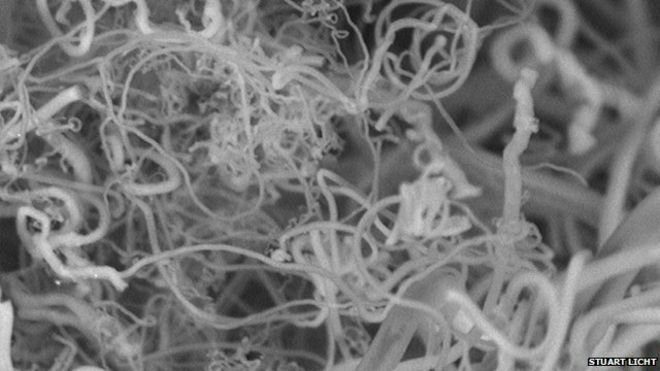 Licht uses a one-pot synthesis to produce the fibres, which utilises molten electrolysis with inexpensive Nickel and Iron electrodes. Although it has only been developed to a 10 gram per hour scale so far, the process has potential to efficiently produce high quantities of this useful material. Professor Licht even suggests that this may be a viable way to remove the greenhouse gas from the atmosphere, but whether this proves viable on a large enough scale to be significant is uncertain. Nevertheless, the proven ability to cheaply and efficiently turn the carbon from the air around us into a useful material is not only impressive, but exciting for the future. Whether you’re a researcher or just a lover of Chemistry in general, I’m sure you’ve wanted to write about the science to a general audience, and it isn’t always the easiest thing to do. In this article by American Scientist writer Katie Burke, she explains 12 top tips for getting your science across to the public. She explains that the main difficulty with communicating science to the public is that scientists are generally not trusted by the general population, and we appear to be cold and unemotional. This may because we’re taught to write this way for publications, and we don’t develop the skills to effectively explain our work to non-scientific audience. Katie explains how we need to change from our traditional publication writing style, by drawing the reader’s attention and keeping them interested throughout. The public want us to tell them the story of our work, and show them why they should care about it. Unlike traditional science writing, Katie explains that you need to make your communication more personal – try using the first person and connect your audience with the people involved in the science. This goes against everything we’re told about in writing for journakls, but it’s what the public want to hear! The article is both interesting and useful, and will serve you well if you want to blog, write or talk about your Chemistry to a general audience. One of the best tools you can have is to get non-scientists or even just non-chemists interested in your work. More support is always a good thing! Should graduate students be required to reproduce research? We’ve all had the problem arise where you try to repeat work that has been published in the literature just to find that it seemingly isn’t reproducible. Sometimes, it’s just a matter of tweaking the prep a little to make it suit you better, but others, no matter what you do, just can’t be repeated. What is there to be done about this? Well, in the field of psychology, they are currently undergoing what they call a ‘irreproducibility crisis’, whereby confidence in the field is being lost by the findings of many studies being unable to be repeated. This article, published on the Nature website, highlights suggestions by experts which suggest that PhD students should be required to reproduce work from the literature before being allowed to graduate. It’s certainly an interesting prospect. Although the article focuses on the field of psychology, it does bring about the idea of requiring chemistry and related PhD students to successfully repeat a published synthetic procedure or analytical study before they are deemed competent enough to be able to graduate. In a way, I can see the merit in this idea. If a reliable set of published work can be found, it could be a useful way of testing a chemist’s practical ability before they’re able to gain their PhD and go out into the world of research. However, how can we be sure that the problem of irreproducibility may be down to an unskilled researcher, and not just the unreliable work that has found its way into the literature? Furthermore, comments in the article suggest that the task of reproducing work should go to more senior researchers who have the expertise to carry out research with a higher level of skill, and who have the experience and background knowledge to know why it may not be working. Also, experts are wary that forcing students to carry out this work will make it appear as “grunt work” and just be taking advantage of the cheap labour offered by graduate students. There is also a suggestion that reproducibility work should be more widely published, so as to encourage researchers to carry it out, and should be more highly regarded on CVs and by hiring committees. If this was the case, perhaps it would pave the way for researchers to “clean up the literature“. This is definitely an interesting topic, and one which will certainly divide opinion. What do you think? Have you had experience with poor reproducibility in the literature?